Beautifully engraved certificate from the W.T. 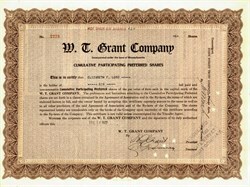 Grant Company issued no later than 1923. This historic document was printed by the American Banknote Company and has an ornate border around it with the company's name on top center. This item has the signatures of the Company’s President and Founder, W. T. Grant and Secretary and is over 95 years old. William Thomas Grant had a dream to own his own store. At 30, Mr. Grant opened his first "W. T. Grant Co. 25 Cent Store" in Lynn, Massachusetts, with $1,000 he had saved from his work as a salesman. 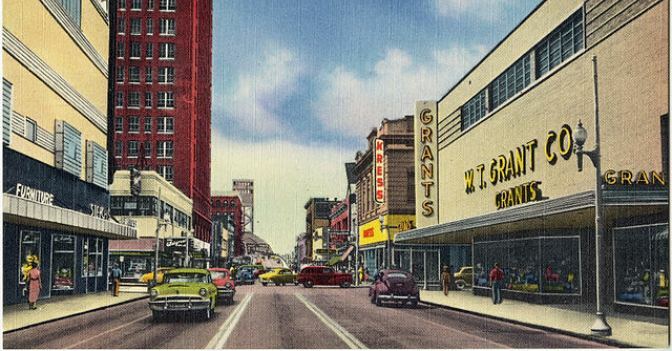 By the time Mr. Grant passed away in 1972, at age 96, his nationwide empire of WT Grant Stores had grown to almost 1,200. Mr. Grant was a born salesman with a will to succeed. At age 7, he began his sales career by selling flower seeds. Years later, when he began shaping his own philosophy of chain merchandising, Mr. Grant discovered that he wanted to sell people what they needed at prices they could afford, with only a modest profit. This modest profit, coupled with a fast turnover of inventory, caused Mr. Grant's business to grow to almost $100 million a year in sales by 1936, the year he started the Grant Foundation. His concern for a fair deal won him much respect from his customers, who always came first in Mr. Grant's opinion. Mr. Grant, as a philanthropist in the truest sense of the word, was concerned for all people and for the world. Writing in the dark days of the late 1930's, Mr. Grant said "Nothing would suit me better than to be able to contribute something to a Real World Peace." In his later years, Mr. Grant was Chairman of the Board of the WT Grant Company, and President of the Grant Foundation and later Chairman of the Board. Among his avocations were philosophy, painting, and local philanthropy. He received honorary Doctor of Laws degrees from Bates College in Maine and the University of Miami. He retired from both the WT Grant Company and the Grant Foundation at age 90, yet still served in an honorary capacity until his death. History from the Grant Foundation and RM-Smythe.com.